DoYourData Uninstaller Pro offers all-in-one solution for Windows users to completely uninstall programs, Windows apps, and plug-ins from computer. It will uninstall selected programs and completely clean up all leftovers like program junk files, registry, logs, etc. This powerful PC uninstaller is pretty simple to use. You can easily uninstall even the most stubborn programs, crashed or broken applications, useless plug-ins from your computer and quickly clean up all leftovers. DoYourData AppUninser is a very powerful Mac Uninstaller and multi languages remover. It can completely uninstall Mac application and remove associated files, clean up all leftover. DoYourData AppUninser also can remove unnecessary multi languages of applications on your Mac to reclaim much free disk space. Completely Uninstall Mac Applications Installing a Mac application is very easy. But completely removing the installed application is complicated. 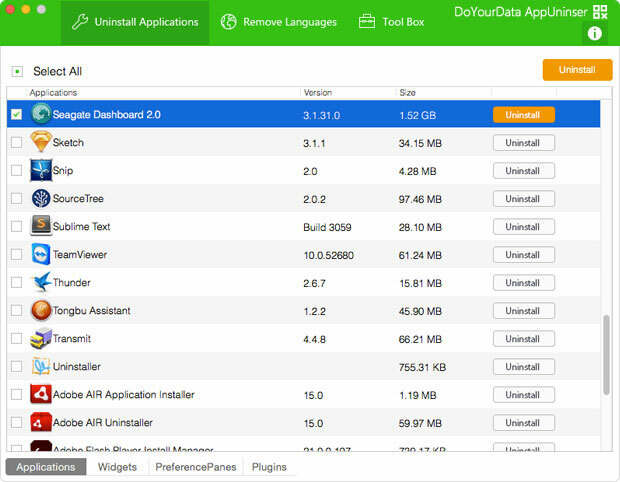 DoYourData AppUninser is designed for completely uninstalling Mac applications, widgets, plug-ins. It will remove all parts of the selected application, clean up all junk files and traces that produced by the application. – Support to uninstall applications that you download from Mac App Store or from other websites. – Completely uninstall the application and remove associated files including junk files that produced by the application, registry files, traces, etc. – Even can completely uninstall the virus infected, crashed, stubborn application on your Mac. – Support to uninstall applications in batches. Easily Remove Unused Multi Languages Many applications are developed with multi languages. The multi languages files take up a great deal of disk space, but some of them are useless. DoYourData AppUninser can help you easily remove the unnecessary languages of the applications. 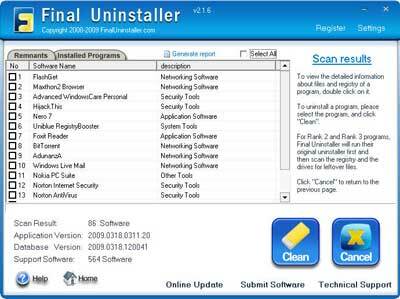 PCUninstaller is a kind of excellent uninstall tool to help you uninstall any unnecessary windows programs. With its advanced and fast algorithms, PC Uninstaller will display all programs in the program list and analyze an application”s data your want to remove before the next step of uninstalling. Therefore, it is very safe for you to use PC Uninstaller to remove any windows programs because of its wonderful precision. Also, PCUninstaller is easy-to-use software for anyone even though you have no basic knowledge of computer. Furthermore, PCUninstaller helps you tune up your PC by removing junk files, duplicate files and invalid registry entries. :: Meticulous :: AppBolish is the ultimate solution for correctly uninstalling apps! Dragging apps to the Trash can leave numerous caches, logs, and support files littered all over the hard drive. This clogs up valuable disk space! Every app is analyzed, after-which AppBolish begins to deeply scan the computer for all related items and presents a final list for review before removal. :: App Overload :: In a world where apps come cheap, information comes fast, and productivity is imperative, it can be common to download many demo versions of apps to determine which suits your needs the best. When the decision has been made to buy, make sure to get rid of the other apps that didn’t make the cut completely. Leaving the remnants of old apps behind can cost a lot of disk space, and can catch you off guard in a time when you need it the most! :: Evolving :: Not all apps are created equally and some definitely do not behave! We continually monitor user feedback, research new releases, and partner with developers to test apps before they are released! Perfect Uninstaller is a better and easier way for you to completely uninstall any unneeded application that the standard Windows Add/Remove Program usually can’t do. Our product has been the favorite to all our customers simply because the design is unique with ease in use but powerful in efficiency, as well as to the resellers who seek for a higher conversion rates. 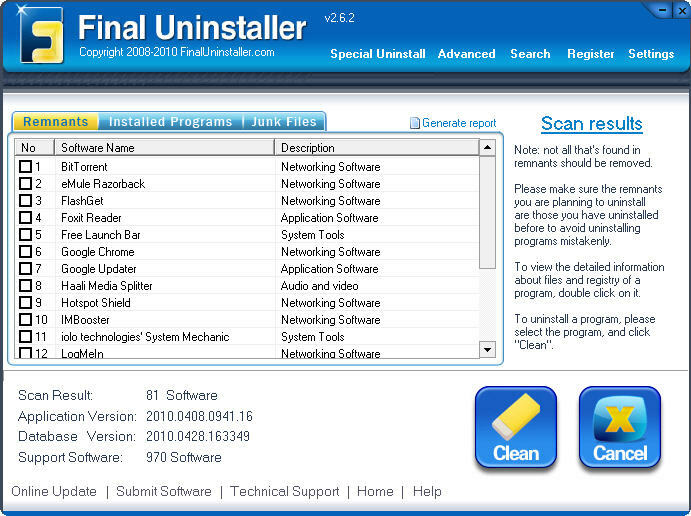 Final Uninstaller provides an easy and comprehensive solution for uninstalling unwanted programs, whether they are installed ones running properly on your computer now or corrupted ones after failed uninstalls. Additionally, Final Uninstaller offers you Junk Files Cleaner, Registry Cleaner, Disk Defragmenter and other useful tools that can help you optimize your PC by removing junk files, cleaning the registry and defragmenting disks. Key Features: Identify all programs installed on your PC. Scan your computer for corrupted programs and remnants. Sort scan results by Install Date, Software Name, Publisher and Rank. Help to search for a specific program to uninstall it. 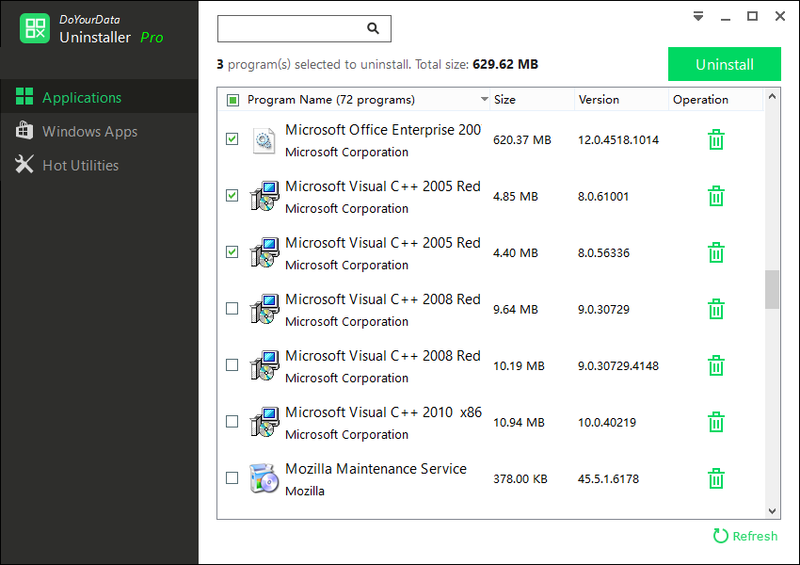 Browse detailed information on the program before uninstalling it. Provide special uninstall in safe mode for stubborn programs. Recover inadvertently deleted programs to a previous state. Remove obsolete and invalid registry entries to avoid annoying error messages. Find and remove various types of junk files to free up valuable disk space. Delete temporary and unnecessary files in the background without disturbing normal Windows use. Defragment disks to reclaim the speed of your disks. Support HTTP proxy server to speed up access to our server when there is a slow connection. Generate scan report that records detailed information of installed programs and remnants of uninstalled programs. Update no less than 2 times a week to enjoy latest technology. Submit feature lets you submit programs to us if uninstall failed. Top quality among the similar products. Multi award winning software. Free and unlimited technical support. Easy to use. Even you know nothing about PC, you still can use it. Good value for money. Only $27.95 for up to 3 PCs 100% safety and satisfaction guaranteed! 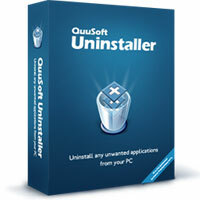 With QuuSoft Uninstaller, you can uninstall any unwanted applications in your Windows system much easier and faster. The standard “Windows Add or Remove Programs” control panel applet can not often completely uninstall all application files, folders and broken associated registry keys. Unlike the standard applet, QuuSoft Uninstaller not only can uninstall the application files and folders, but also clean the registry entries left over themselves. Thus, it will protect your PC from the corrupted registry errors, safeguarding the stable performance and improving the efficiency of your computer! With QuuSoft Uninstaller, you can thoroughly search, precisely locate and completely uninstall any application and its leftovers, such as broken registry keys, unnecessary files and folders! Softboy.net On-screen-keyboard can be useful if you have mobility impairments, if you are using a tablet PC, or if your keyboard goes down. And it can works well on touch-screen. This a demo keyboard which includes the main keys on a normal keyboard. If the current soft on-screen-keyboard can not fulfill your requirement, please access our homepage and send us your requirement. We will design it for you.